It took me until the season finale to get to writing about the relations in the series. I won’t deny, I was thinking of not even watching. After The White Queen, I was repulsed. Ok, so there are NO other shows that feature this time period–with such depth. Surprisingly, I fell in love with this series. Why? Actors were better and the clothing of Queen Elizabeth was gorgeous! Big thank you to the costume designers and hair dressers! BRAVO! So, why am I doing an article on Katherine Parr in relation to those historical figures featured in The White Princess? Because the Parr family was there at court. They were ALWAYS there. Why are they not featured? I honestly have no idea. It’s a pity that these shows don’t weave in connections to the future Queens of England. We know that the Boleyn, Seymour, and Howards were present. The Howards are the easiest to track. The Boleyn family starts to come around with the Howards eventually. And the Seymours? They are also around, somewhere. The Parr family, however, were courtiers to the Crown since the 1300s. In the reign of Henry Tudor, the Parrs’ were quite close to the crown on both the side of Henry AND Elizabeth. Sir William Parr had died shortly after the coronation of King Richard III and Queen Anne. His widow, Lady Elizabeth (born FitzHugh), had been a lady-in-waiting to Queen Anne as Duchess and Queen. She was part of the coronation and witnessed her niece and cousin being crowned. After the death of her first husband, Lord Parr, Elizabeth would marry again to a very close ally of the Lancastrians/King Henry. His name was Sir Nicholas Vaux. He was the son of Lancastrian sympathizers. 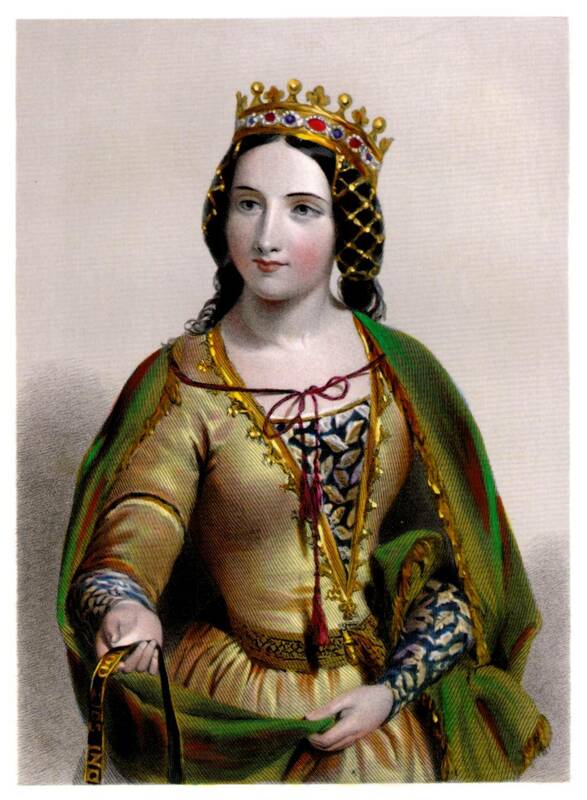 His mother was a lady to Queen Margaret of Anjou and was with her in exile. Lady Margaret Beaufort was close to Parr’s step-father, Sir Nicholas Vaux, who had been educated in her household. Parr is also believed to have spent some time in her household and may have been educated there as well. That wouldn’t be completely absurd seeing how close Margaret was to the Vaux family. Katherine’s father, Sir Thomas Parr, was a close friend of King Henry VIII. Sir Thomas was present at court and was in the circle of Henry VIII which included Sir Thomas Boleyn. Both were knighted in 1509 at Henry’s coronation; Parr was also made a Knight of the Garter and appointed Sheriff of Northamptonshire on that occasion. Parr became Master of the Wards and Comptroller of the household of Henry VIII. Parr’s brother, William [later Baron Parr of Horton], was also a part of the King’s circle. They kept company with the Staffords and their cousins, the Nevilles. They were also friend’s with the Carews and Sir Thomas Boleyn, father of Queen Anne Boleyn. In 1515, Parr was entrusted with escorting Queen Margaret of Scotland [the king’s elder sister] from Newcastle back to London. As for Elizabeth of York’s connection to Katherine Parr, we have it on both sides. One comes from her father’s royal blood and the other comes from a Woodville connection that connects her mother to one of Elizabeth Woodville’s relatives. Lady Parr’s grandmother, Lady Alice Fogge (Haute) was a lady to Queen Elizabeth Woodville. When Elizabeth became queen to Edward IV, she brought her favorite female relatives to court to serve her. Lady Fogge, was one of five ladies-in-waiting to her cousin, Queen Elizabeth, in the 1460s. The night before the coronation, like monarchs before her, Duchess Anne of Gloucester (born Lady Anne Neville) stayed in The Tower of London. For the procession from the Tower to Westminster on the eve of the ceremony, she wore a kirtle and mantle made from 27 yards of white cloth-of-gold furred with ermine and miniver, and trimmed with lace and tassels of white silk and gold (Laynesmith, p. 92). Both King and Queen had their own separate attendants and train. Lady FitzHugh (born Lady Alice Neville) and her daughter Lady Parr (born Elizabeth FitzHugh) were two of the seven noble ladies to ride behind the queen. Lady FitzHugh was an aunt to Queen Anne and a cousin to King Richard. These two ladies were of course great-grandmother and grandmother to another queen consort, Katherine Parr. Both were dressed in fine dresses made by cloth that the King himself had given them. Lady Parr received seven yards of gold and silk; her mother received material for two gowns, one of blue velvet and crimson satin as well as one of crimson and velvet with white damask. As befitting of a Baroness, eight yards of scarlet cloth was given for mantles on the occasion. Lord Parr (Sir William Parr) chose not to attend the coronation despite being given a position as canopy bearer. Lord Parr had been a staunch supporter of King Edward IV through whom he rose. Queen Anne’s arms as Queen of England. After the procession of the king followed that of his queen Anne [Neville]. The earl of Huntingdon bore her sceptre, the viscount Lisle the rod and dove, and the earl of Wiltshire her crown. Then came the queen herself habited in robes of purple velvet furred with ermine having on her head a circlet of gold with many precious stones set therein. Over her head was borne a cloth of estate. On one side of her walked the bishop of Exeter on the other the bishop of Norwich. A princess of the blood, the celebrated Margaret, countess of Richmond, mother of Henry VII supported her train. After the queen walked the king’s sister Elizabeth, duchess of Suffolk, having on her head a circlet of gold and after her followed a train of highborn ladies succeeded by a number of knights and esquires. Entering the abbey at the great west door the king and queen took their seats of state staying till divers holy hymns were sung when they ascended to the high altar where the ceremony of anointing took place. Then the king and queen put off their robes and there stood all naked from the middle upwards and anon the bishop anointed both the king and the queen. This ceremony having been performed, they exchanged their mantles of purple velvet for robes of cloth of gold and were solemnly crowned by the archbishop of Canterbury assisted by the other bishops. The archbishop subsequently performed high mass and administered the holy communion to the king and queen after which they offered at St Edward’s shrine where the king laid down King Edward’s crown and put on another and so returned to Westminster Hall in the same state they came. Richard III with his queen Anne and son, Edward, Prince of Wales. 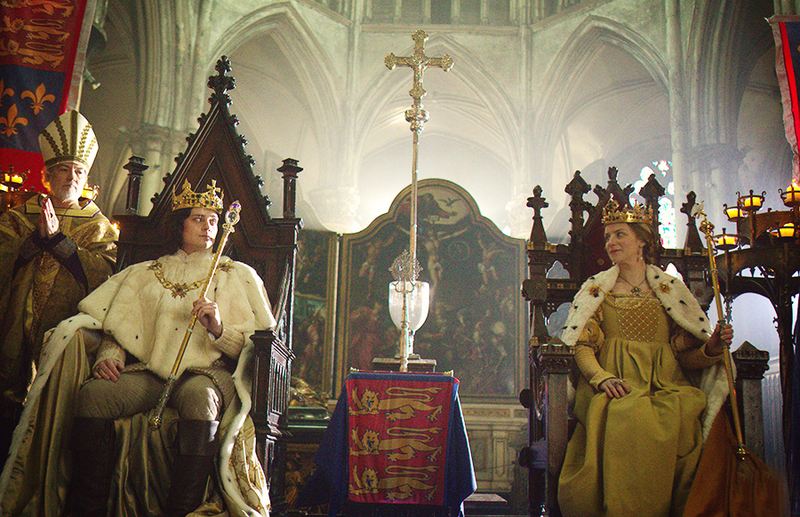 Aneurin Barnard as King Richard III and Faye Marsay and Queen Anne. 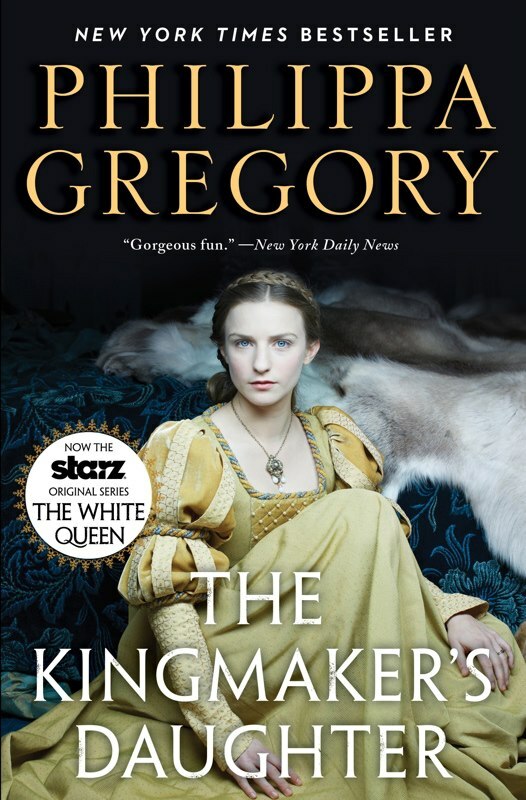 Fictional portrayal in Philippa Gregory’s “The White Queen” (2013). William Hickman S. Aubrey. “The National and Domestic History of England,” 1878. pg 193-4. Hannah Lawrance. “Historical Memoirs of the Queens of England from the Commencement of the Twelfth Century,” Volume 2, Moxon, 1840. 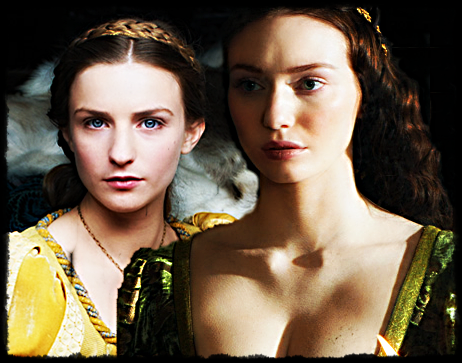 Lady Isabel (Eleanor Tomlinson) and Lady Anne (Faye Marsay); daughters of Lord and Lady Warwick. The Kingmaker’s Daughter is the gripping story of the daughters of the man known as the “Kingmaker,” Richard Neville, Earl of Warwick: the most powerful magnate in fifteenth-century England. Without a son and heir, he uses his daughters Anne and Isabel as pawns in his political games, and they grow up to be influential players in their own right. In this novel, her first sister story since The Other Boleyn Girl, Philippa Gregory explores the lives of two fascinating young women. 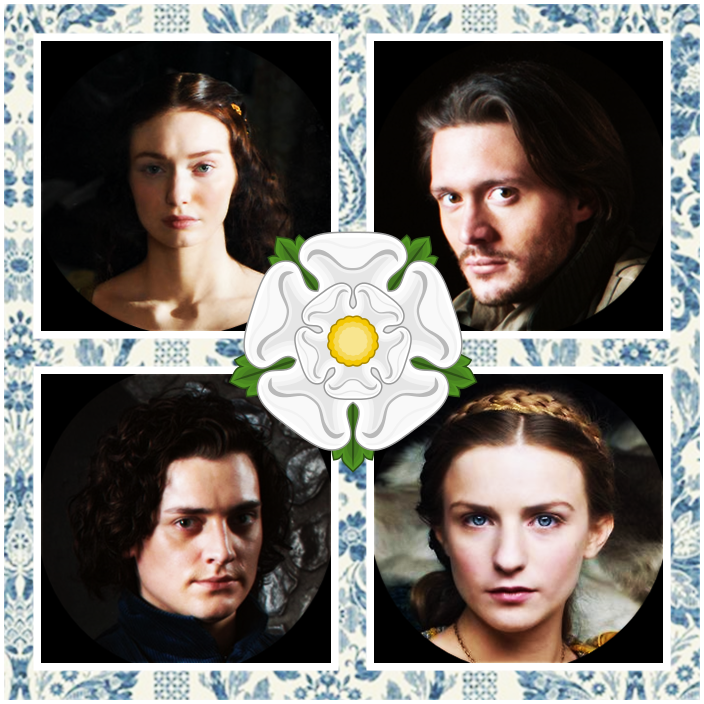 At the court of Edward IV and his beautiful queen, Elizabeth Woodville, Anne grows from a delightful child to become ever more fearful and desperate when her father makes war on his former friends. Married at age fourteen, she is soon left widowed and fatherless, her mother in sanctuary and her sister married to the enemy. Lady Warwick (Juliet Aubrey) with her daughters, episode 4. Lady Anne (later Queen) is portrayed by Faye Marsay and Lady Isabel (Duchess of Clarence) is portrayed by Eleanor Tomlinson. Their mother, Lady Anne Beauchamp, 16th Countess of Warwick is portrayed by Juliet Aubrey. Princess of Wales (1470-1471) as wife to Prince Edward of Lancaster, Prince of Wales. Dowager Princess of Wales (1471-1472) as widow of Prince Edward of Lancaster, Prince of Wales. Duchess of Gloucester (1472-1483) as wife to Richard, Duke of Gloucester. Queen consort of England (1483-1485) as wife to Richard, Duke of Gloucester, who became King Richard III in 1483. Both Anne and Isabel were nieces of Lady Alice FitzHugh (born Neville) (paternal great-grandmother of Queen Katherine Parr). Parr’s grandmother, Elizabeth FitzHugh, was cousin to Lady Anne and Lady Isabel and served as a lady to Queen Anne. The two families, FitzHugh and Neville (Lord Warwick), were close due to the proximity of the two families; they lived near each other and FitzHugh was close to both the Earl of Salisbury and his son, the Earl of Warwick. Queen Anne personally appointed Elizabeth and her mother Lady Alice much like Woodville did with Parr’s maternal great-grandmother Lady Fogge. Both women were part of the coronation of King Richard and Queen Anne and received gifts from the King. However, Elizabeth’s husband (Parr’s grandfather), refused his part in the coronation and returned north where he died shortly after. I often wonder what their family thought when Edward married Woodville even though Lord William Parr rose highly under Edward IV. The White Queen BBC one commercial – Directors cut from Jamie Childs on Vimeo. STARZ. “The White Queen,” August 2013. Michael O’Connell. “Starz Releases First Look at ‘White Queen’ (Video),” 7 February 2013. Jamie Childs. “The White Queen BBC one commercial – Directors cut,” 9 May 2013. Impaled arms of Parr and FitzHugh, Hampton Court Palace Pedigree window of Katherine Parr. Sir William Parr, Baron Parr of Kendal (1434-bef. 26 February 1484[2, see notes]/Autumn 1483) KG was a courtier and soldier best known for being the grandfather of Queen Katherine Parr, Lady Anne Herbert, and William, 1st Marquess of Northampton. His granddaughter would become the sixth and final queen of King Henry VIII and his grandson would become one the most powerful men during the reigns of Edward VI (as the king’s “beloved uncle”) and Elizabeth I.
Parr was the eldest son of Sir Thomas Parr and Alice Tunstall, daughter of Sir Thomas Tunstall of Thurland. His paternal grandparents were Sir John Parr of Kendal Castle and the heiress Agnes Crophull of Weobley, widow of Sir Walter Devereux. Her family owned Weobley Castle in Herefordshire which passed to her children by Devereux. By his mother Agnes, Thomas Parr was a half-brother of Walter Devereux Esq. Parr’s grand-nieces and nephews included Sir Walter, 1st Baron Ferrers of Chartley and Lady Elizabeth (Devereux), Countess of Pembroke [wife to William Herbert, 1st Earl of Pembroke] which would give the Parr’s connections to some of the most important nobility at court. Thomas Parr’s other brother, Bryan, became Lord of Parr Manor from which a branch of the Parr family, which still resides in England, descends. His maternal grandparents were Sir Thomas Tunstall of Thurland Castle and Isabel Harrington, daughter of Sir Nicholas and Isabel English. Sir Thomas Tunstall would go on to marry Hon. Joan Mowbray, daughter of Lord Mowbray and Lady Segrave and thus become the step-father of her children by Sir Thomas Grey which included the 1st Earl of Tankerville. 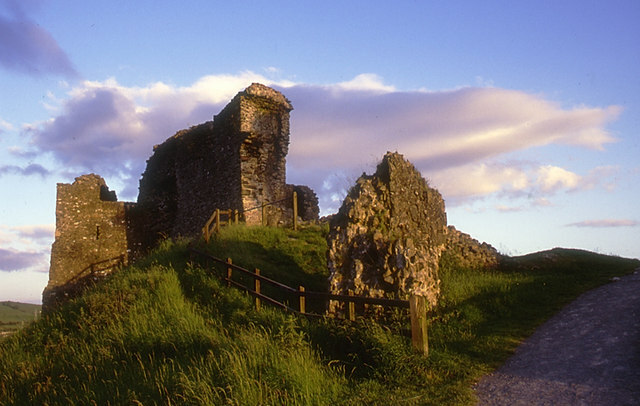 Kendal Castle was acquired through the marriage of Sir William de Parr to the heiress and only child of Sir John de Ros of Kendal, Elizabeth de Ros in 1383. Lord Parr was the last to reside at Kendal. The Parr family had been long established in Parr, Lancashire. Parr’s family resided in Kendal. By marriage they inherited Kendal Castle and 1/4 of the Barony of Kendal which would come to be known as the “Marquis Fee.” Parr’s father, Thomas, was part of the War of the Roses and fought on the Yorkist side. He was attained in 1459 with the other Yorkists’, but the attainder was reversed in 1461 as he died in 1464. All of Parr’s siblings married into prominent families. 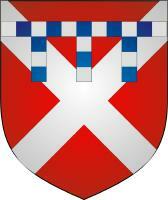 His brother, Sir John, also a Yorkist, was rewarded in 1462 by being made Sheriff of Westmorland for life. Sir John would marry a daughter of Sir John Yonge, Lord Mayor of London. Parr’s other brother, Sir Thomas, was killed at Barnet. His sister, Mabel, married to Sir Humphrey Dacre, Baron Dacre of the North. Another sister, Agnes, would marry to Sir Thomas Strickland of Sizergh Castle. And Margaret married Sir Thomas Radcliffe. Lord Parr was high in favor and a close friend with King Edward IV and repaid it with great fidelity. In 1469, he was on the side of the Nevilles during the battle of Banbury. In 1470, before the battle of Lose-coat-Fields he was sent by Clarence (the King’s brother) and Warwick (his wife’s uncle) and was entrusted with his answer. In 1471, Parr was one of the commissioners appointed to adjust with James III of Scotland of some alleged violations of the truce, which including a marriage treaty. 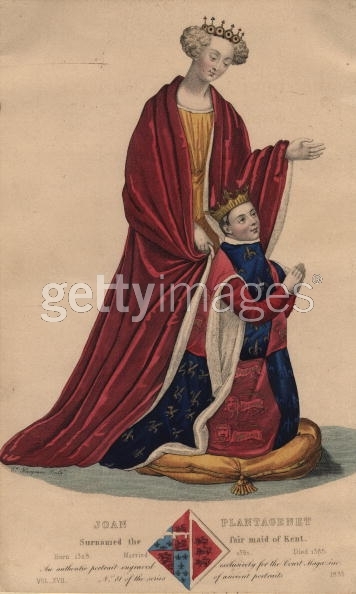 On the return of King Edward again to contest his right to the crown, with Margaret Anjou supported by Warwick, Parr met him at Northampton with a considerable force and thence inarched to Barnet field where he was decided in favour of his royal master. Also in 1471, Sir Henry Stafford and his wife, Lady Margaret Beaufort (mother of King Henry VII), conveyed to him two parts of the lordships of Grasmere, Loghrigge, Longdon, Casterton, Hamelsett, and Troutbeck with their members, the hamlets of Applethwaite, Undermilbeck, and all lands in them; the close or park of Calgarth, the herbage and pannage of the same, the fishery in and of the water in Windermere, etc. Westmorland. For his loyalty and part at Barnet, Parr was rewarded with the office of Comptroller of the Household which he held from 1471 to 1475 and again in 1481 till Edward’s death in 1483. Lord Parr was created a knight barrenet and was one of only two courtiers to become a Knight of the Garter in the second reign of Edward IV. He was MP for Westmoreland in the 6th and 12th Edward IV and served as sheriff of Cumberland in 1473. in 1475, he travelled with the King on his expedition to France. In 1483, he was constituted chief commissioner for exercising the office of constable of England and was made ambassador to treat with the embassy from Alexander, Duke of Albany (son of James II of Scotland and uncle to James IV). Upon the death of King Edward, he was part of the funeral. Arms of the heirs of Sir Richard Neville, 5th Earl of Salisbury, eldest son of Sir Ralph, 1st Earl of Westmorland by his second wife, Lady Joan Beaufort, daughter of John of Gaunt, 1st Duke of Lancaster and Katherine Swynford. Sometime after 1475, Parr married secondly to Hon. Elizabeth FitzHugh, daughter of Lord FitzHugh and Lady Alice Neville (sister of Warwick and cousin to Edward IV and Richard III). Lord FitzHugh was the associate of Richard Neville, 5th Earl of Salisbury (Elizabeth’s grandfather). Lord FitzHugh had been a long-standing supporter of the Neville family; he supported the Earl of Salisbury in his dispute with the Percy family in the 1450s. FitzHugh also served with the earl on the first protectorate council. Lord FitzHugh would go on to become a close ally of Richard Neville, 16th Earl of Warwick [“Warwick, the Kingmaker”] during the War of the Roses. In about 1452, FitzHugh would marry into the Neville family, marrying a sister of Warwick, Alice. Due to the affiliation of Parr’s second wife to the Royal family, Parr was pressured by his mother-in-law, Lady FitzHugh, to follow the rule of her cousin, the Duke of Gloucester (later King Richard III), while he was serving as Lord Protector of the Realm. Parr, however, was not persuaded that Richard’s determination for the throne was justified. 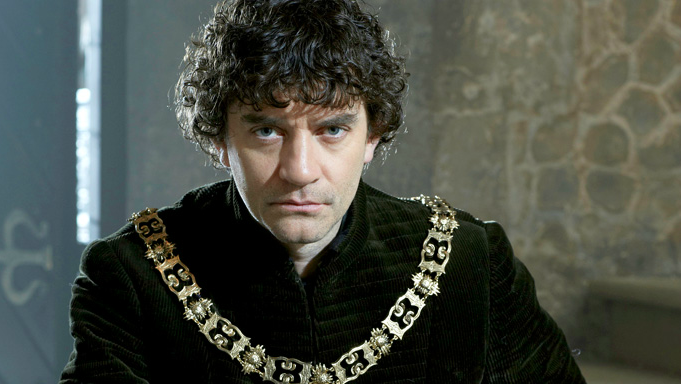 The murder of William, Lord Hastings on 13 June 1483 was the tipping point. Hastings had been a close friend and adviser of the late King Edward IV. Parr was no doubt a friend as well as a relation (Hastings was Parr’s uncle by marriage; Hastings was married to Lady Katherine Neville, another sister of Warwick). Parr was loyal to the institution of the monarchy, but deserted the idea of usurpation, however justified it was in political terms. When Richard became King, Lord Parr chose not attend the coronation. Parr had even been given a position in the coronation as canopy bearer. Lady Parr and her mother, however, were present. Both were dressed in fine dresses made by cloth that the new King himself had given them. Elizabeth received seven yards of gold and silk; her mother received material for two gowns, one of blue velvet and crimson satin as well as one of crimson and velvet with white damask. It is not known which gown Elizabeth wore as she rode behind Queen Anne (Neville); but she was one of the seven noble ladies given this honour. After the coronation, Lady Parr was personally appointed by the new Queen and served as lady-in-waiting to her cousin, whom she was close to. Queen Anne was the younger daughter of Lady Parr’s uncle, Lord Warwick. 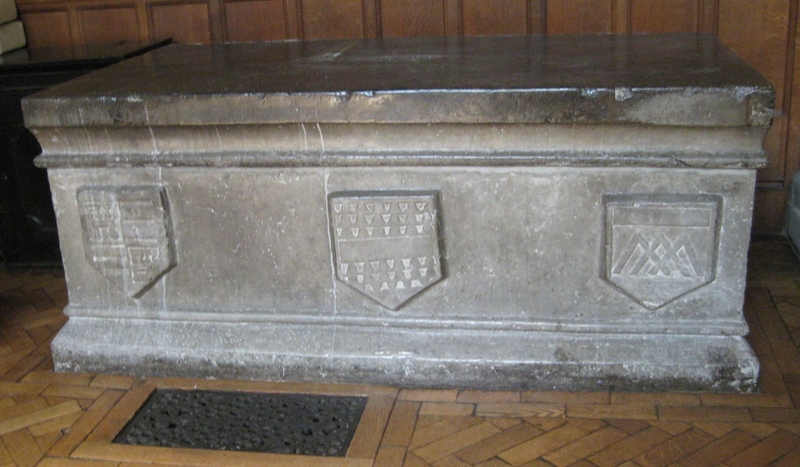 Tomb of William Parr, Kendal Parish Church. 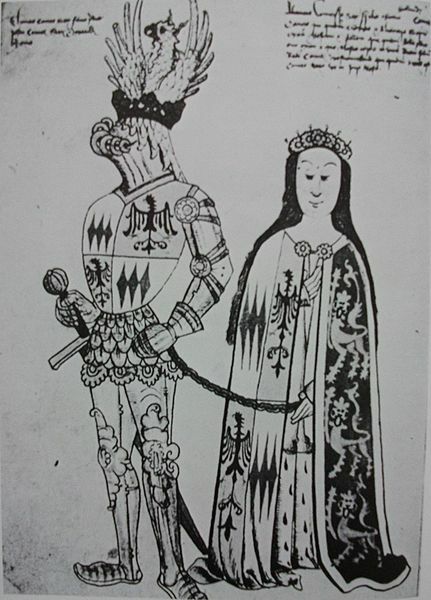 Before July 1468, Lord Parr was married firstly to Joan Trusbut (d.1475). The marriage produced no known children, however, Joan left a son, John, from her previous marriage to Thomas Colt Esq. of Roydon (d.1467). After Joan’s death, her son’s wardship was granted to Lord Parr. (The Manors of Suffolk) Colt most likely grew up with the children of Parr’s second marriage. Colt would marry and have a daughter, Jane, the first wife of Sir Thomas More. Anne Parr, Lady Cheney (AFT 1475–4 November 1513), who married Sir Thomas Cheney of Irthlingborough. Their daughter Elizabeth, would go on to marry the son of Nicholas Vaux, 1st Baron Vaux of Harrowden (Elizabeth FitzHugh’s second husband) by his second marriage to Anne Green; maternal aunt to Katherine Parr. When Elizabeth Cheney married Lord Vaux, she was age 18 and he was age 14. While there were no blood relations, Lord Vaux’s father had issue by his marriage to his first wife (see below); thus making Hon. Katherine, Hon. Alice, and Hon. Anne Vaux her maternal aunts. Through these relations, Elizabeth Cheney and her husband, the 2nd Lord Vaux, would have Throckmorton cousins in common. Elizabeth Cheney (or Cheyne), Lady Vaux of Harrowden; daughter of Anne Parr and Sir Thomas Cheney. Sketch by Holbein. Sir Thomas Parr, Lord of Kendal (AFT 1475–11 November 1517), who was the eldest son, was knighted and was sheriff of Northamptonshire in 1509; he was master of the wards and comptroller to Henry VIII. He was rich, owing to his succeeding, in 1512, to half the estates of his cousin, Lord FitzHugh, and also to his marriage with Maud Green, daughter and coheiress of Sir Thomas Green of Boughton and Greens Norton in Northamptonshire. He died on 12 November 1518, and was buried in Blackfriars Church, London. His widow died on 1 September 1532, and was buried beside him. They were parents to Queen Katherine Parr, William Parr [1st Marquess of Northampton], and Anne Parr [Countess of Pembroke]. Sir William Parr, 1st Baron Parr of Horton (BEF 1483–10 September 1547), the second son, was knighted on 25 December 1513, was sheriff of Northamptonshire in 1518 and 1522, and after his niece’s Katherine Parr’s promotion became her chamberlain. On 23 December 1543 he was created Baron Parr of Horton, Northamptonshire. He died on 10 September 1547, and was buried at Horton (for his tomb, see Bridges, Northamptonshire, i. 370). By Mary, daughter of Sir William Salisbury, he left four daughters. John Parr, Esq. (BEF 1483–8 September 1508), married Constance, daughter of Sir Henry Vere of Addington, Surrey. They had no issue. Alice, died young (b. before 1483). After her husband Sir William Parr died in 1483, Elizabeth, who was twenty three at the time, was left with four small children. A familiar situation which Queen Katherine’s own mother would find herself in when her husband died in 1517, leaving her with three small children. Instead of choosing not to re-marry, like Maud Parr, Lady Parr made a dubious second marriage with a protege of Lady Margaret Beaufort [mother of the new King], Sir Nicholas Vaux, the future 1st Baron Vaux of Harrowden, which saved the family fortunes. Linda Porter. “Katherine, the queen,” Macmillan, 2010. Douglas Richardson. “Plantagenet Ancestry,” Genealogical Publishing Com, 2011. pg 662. James, Susan. Catherine Parr: Henry VIII’s Last Love. (2009), pg 15, 81. Hon. 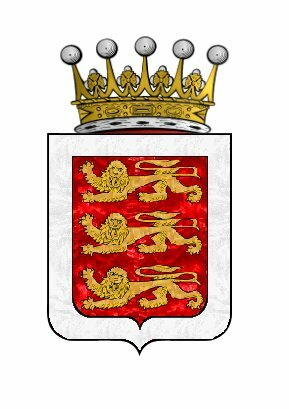 Elizabeth FitzHugh Lady Parr of Kendal and Lady Vaux of Harrowden (1455/65 – 29 January 1508) was an English noblewoman and the co-heiress to her father, Hon. Sir Henry FitzHugh, 5th Baron FitzHugh of Ravensworth. Lady Parr is best known for being the grandmother of the sixth queen of Henry VIII, Katherine Parr and her siblings Lady Anne Herbert, Countess of Pembroke and William Parr, 1st Marquess of Northampton. 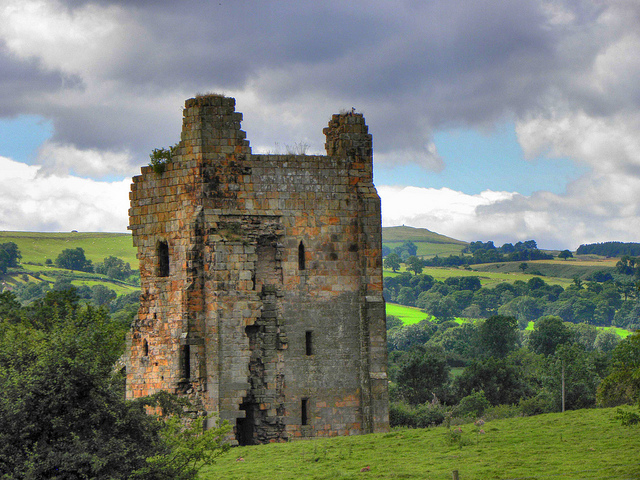 Elizabeth FitzHugh was born at her family’s ancestral home, Ravensworth Castle, in North Yorkshire, England. She was the daughter of Sir Henry FitzHugh, 5th Baron Fitzhugh of Ravensworth Castle. Her family was of the Northern gentry. Lady Parr’s mother was born Lady Alice Neville, daughter of Sir Richard Neville, 5th Earl of Salisbury and Lady Alice Montacute, suo jure 5th Countess of Salisbury, only daughter and heiress of Sir Thomas Montague, 4th Earl of Salisbury and Lady Eleanor Holland. Her paternal grandparents were Sir William FitzHugh, 4th Baron Fitzhugh of Ravensworth and Marjory Willoughby, daughter of Sir William Willoughby, 5th Baron Willoughby de Eresby and his first wife, Lucy Le Strange. Through her mother Lady FitzHugh, Lady Parr descended from Edward III by his son Prince John of Gaunt, 1st Duke of Lancaster and Titular King of Castile. Lady FitzHugh was sister to Sir Richard Neville, 16th Earl of Warwick (“Warwick, the Kingmaker”). Her paternal aunts included Lady Cecily, Duchess of York making her a cousin to King Edward IV, Richard III, and his siblings. Elizabeth had nine siblings, including Alice FitzHugh, Lady Fiennes and Henry, 6th Baron FitzHugh who married Elizabeth Burgh, daughter of Sir Thomas Burgh, 1st Baron Burgh of Gainsborough. Their son George, the 7th Lord FitzHugh, inherited the barony but after his death in 1513, the barony fell in abeyance between Lady Parr and her older sister Alice, Lady Fiennes. This abeyance continues today between the two families. Elizabeth FitzHugh had an easy-going and pleasure-loving disposition. As Lady Parr, she joined the household of her cousin, the Duchess of Gloucester. The Duchess of Gloucester was born Lady Anne Neville, the youngest daughter of Sir Richard Neville, 16th Earl of Warwick (“Warwick, the Kingmaker”) and Lady Anne Beauchamp. Lady Parr was close to her cousin which showed in her positions under Anne as Duchess and Queen consort. Because of the family connections, Elizabeth’s mother, Lady FitzHugh pressured Lady Parr’s husband, Lord Parr, to follow the rule of the Duke of Gloucester (later King Richard III) while he was serving as Lord Protector of the Realm. When the Duchess became queen in 1483, Lady Parr was appointed by the Queen herself and served as lady-in-waiting. Lady Parr and her mother were both present at the coronation on 6 July 1483. Both were dressed in fine dresses made by cloth that the King himself had given them. Elizabeth received seven yards of gold and silk; her mother received material for two gowns, one of blue velvet and crimson satin as well as one of crimson and velvet with white damask. It is not known which gown Elizabeth wore as she rode behind Queen Anne; but she was one of the seven noble ladies given this honour. Her husband who had been deeply devoted to Edward IV declined his role in the coronation and headed north where he died shortly after. After her husband Sir William Parr died in 1483, Elizabeth, who was twenty three at the time, was left with four small children. As a widow, Elizabeth’s life revolved around the court. Elizabeth would be second in a four generation span of family that would serve England’s queens which started in 1483 with her mother, the redoubtable Alice Neville, Lady Fitzhugh. Her granddaughter, Anne Parr would continue the tradition by becoming lady-in-waiting to all six of Henry VIII’s wives. Even Anne’s sister, Catherine Parr, who would later become queen served in the household of the Lady Mary until she caught the eye of King Henry. Elizabeth was lucky enough to remarry. After the overthrow of Richard III and The House of York, Elizabeth made a dubious second marriage with a protege of Lady Margaret Beaufort, Sir Nicholas Vaux, the future 1st Baron Vaux of Harrowden, which saved the family fortunes. Elizabeth Cheney (or Cheyne), Lady Vaux of Harrowden; daughter of Anne Parr and Sir Thomas Cheney. Sir Thomas Parr, Lord of Kendal (AFT 1475–11 November 1517), who was the eldest son, was knighted and was sheriff of Northamptonshire in 1509; he was master of the wards and comptroller to Henry VIII. He was rich, owing to his succeeding, in 1512, to half the estates of his cousin, Lord FitzHugh, and also to his marriage with Maud Green, daughter and coheiress of Sir Thomas Green of Boughton and Greens Norton in Northamptonshire. He died on 12 November 1518, and was buried in Blackfriars Church, London. His widow died on 1 September 1532, and was buried beside him. Of their children, Katherine Parr, queen of Henry VIII, and William Parr (afterwards Marquess of Northampton), are separately noticed; while a daughter, Anne, married William Herbert, 1st Earl of Pembroke of the tenth creation. The couple also had two other children who died as infants; a son was born before their eldest, Katherine, but was stillborn. The second infant who was conceived after their fourth child, Anne; but was either miscarried, dead at birth, or died shortly after, the same year their father died, 1517. The only descendants alive today are the descendants of their youngest surviving daughter, Anne. Her descendants include the current Earls of Pembroke, Earls of Montgomery, Earls of Carnarvon, and more. After the death of Sir William Parr in fall of 1483, Elizabeth re-married Sir Nicholas Vaux c.1484/5 (probably right before the fall of Richard III), who later became 1st Baron Vaux of Harrowden as his first wife. Vaux was the protege of Lady Margaret Beaufort, mother of King Henry VII, so the marriage came at a good time, saving the family fortunes. Vaux’s mother, Katherine Peniston, had been lady to Margaret of Anjou and as such, the Vauxs’ were sympathetic to the Lancastrian cause bringing the Parr family back in to favor. Lady Katherine Vaux (Peniston) would remain with Margaret of Anjou in exile and died in her service. After the accession of Henry VII, Vaux was raised by Lady Margaret Beaufort. Elizabeth’s son by her first marriage, Sir Thomas Parr (father of Katherine), is thought to have been educated under Beaufort’s tutelage (Susan James) which would explain the closeness he formed with her grandson, King Henry VIII. Vaux became close to his Parr step-children. After the death of Elizabeth, Vaux would re-marry to Anne Green, sister to Lady Maud Parr and thus sister-in-law to Sir Thomas Parr. Hon. Katherine Vaux (abt 1490-1552/1571), married the Catholic Sir George Throckmorton of Coughton Court. Sir George was one of those opposed to the divorce of Henry VIII and Queen Katherine of Aragon. He also opposed the break from Rome. As the divorce of Queen Katherine and the marriage of Anne Boleyn was still pending, Sir George said that the king “had meddled with both the mother and sister.” The couple had 19 children and in his life time 112 grandchildren who were mostly ardent Catholics. For over 500 years now, their family has remained one of England’s oldest Catholic families. British English School An Unknown Lady once called Katherine Vaux, Lady Throckmorton National Trust Collections Coughton Court, Warwickshire 1576. Hon. Alice Vaux (d. 1543), married Sir Richard Sapcott/Sapcote c. 1501. No issue; some genealogies state she was the mother of one of Sapcott’s younger sons, but that has not been proven. Hon. Anne Vaux, married Sir Thomas Le Strange (1493-1545) and had issue. The Complete Peerage vol. V, pp. 428-429. Susan James. “Catherine Parr: Henry VIII’s Last Love,” (2009), pg 15, 81. Douglas Richardson. “Plantagenet Ancestry,” Genealogical Publishing Com, 2004. pg 144, 561. Barbara J. Harris. “English Aristocratic Women, 1450-1550 : Marriage and Family, Property and Careers: Marriage and Family, Property and Careers,” Oxford University Press, Jul 26, 2002. pg 218. Michael Hicks. “Anne Neville: Queen to Richard III,” Tempus, 2006. pg 189. Kendal Castle was acquired through the marriage of Sir William de Parr to the heiress and only child of Sir John de Ros of Kendal, Elizabeth de Ros in 1383. Katherine’s 3x great-grandfather was Sir William Parr (d.1405); in 1383, Sir William de Parre married Elizabeth, only daughter and heiress of Sir John de Ros and Elizabeth le Latimer, daughter of Sir Thomas le Latimer, 1st Baron Latimer of Braybrooke and Lora de Hastings. Elizabeth de Ros was the granddaughter and heiress of Sir Thomas de Ros, Baron of Kendal and had livery of her inheritance. On the accession of the Duke of Lancaster as Henry IV of England, Sir William stood so high in the estimation of the new monarch that he was deputed with the bishop of St. Asaph to announce the revolution to the court of Castile; the King claimed Castile by right of his father, even though his half-sister, Katherine [daughter of the Titular Queen Constanza of Castile], had taken her rightful position as Queen consort after the debate of her Regency. He died on 4 October 1405 being then seized of the fourth part of the manor of Kirby in Kendal. In right of the heiress of Ros and was succeeded by his eldest son, Sir John of Kendal. Church of St. Peter and St. Paul, Weobley, Hertforshire. Agnes Crophull is buried with her 3rd husband, John Merbery. 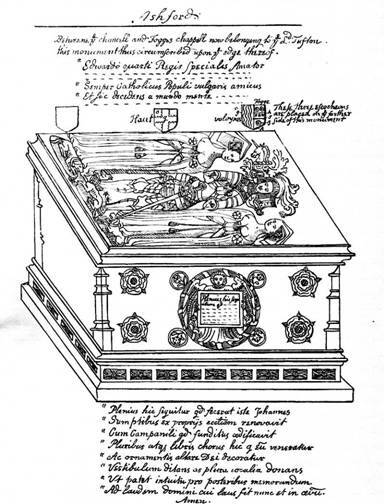 Her first husband, Sir Walter Devereux, has his own tomb and effigy. Katherine’s great-great-grandfather, Sir John Parr (b. circa 1383) married to Agnes de Crophull, the sole heiress to Sir Thomas de Crophull of Weobley Castle and Sybil de Bere. Agnes’s grandfather, Sir John of Bonnington was styled Seigneur of Weobley Castle as owner of Weobley Castle in Hertfordshire. The Castle had been gained through his marriage to Margery de Verdun. The Verdun’s descended from John I of England (Joan, Princess of Wales and Llewelyn Ap ‘The Great’, Prince of Wales) and his sister Princess Eleanor, Queen of Castile (Infanta Berengaria of Castile, Queen Consort of Leon and Alfonso IX, King of Leon). They also descended from King David I of Scotland. Agnes was married firstly to Sir Walter Devereux, Sheriff of Herefordshire by whom she had issue. In 1386, Devereux had livery of her lands through which Weobley Castle passed to his children by Agnes. Agnes’s cousin, Sir John de Crophull had Lordship of Ludlow Castle. Her descendants include Anne Devereux (wife of Sir William Herbert, 1st Earl of Pembroke, 1408 creation) and Sir Walter Devereux, 1st Earl of Essex who married to Lettice Knollys. She was also a great-grandmother to Blanche Milbourne, Lady Troy and thus a great-great-grandmother to Blanche Perry. Agnes’s third husband was Sir John Merbury, Chief Justice of South Wales. The couple had no children, however Merbery had issue from his first marriage, Elizabeth, who ended up marrying her step-brother’s son, Sir Walter Devereux. This connection to Agnes Crophull gave the Parr’s more than a few connections to the gentry and courtiers. Katherine’s great-grandfather, Sir Thomas Parr (b.1407) was Sheriff of Westmorland and Escheator of Cumberland & Westmorland. He married Alice Tunstall, co-heiress of Sir Thomas Tunstall of Thurland Castle and Isabel Harrington. By this connection she was a cousin to Bishop Cuthbert Tunstall who served Henry VIII and all of his children. Under Elizabeth I, he was put under “house arrest” in Lambeth Palace where he died. Isabel Harrington’s sister, Elizabeth, married Sir John Stanley; they were grandparents to Sir Thomas Stanley, 1st Earl of Derby making him a first cousin, three times removed. Derby married Katherine’s great-aunt, Eleanor Neville, by whom he had issue. Upon his second marriage to Lady Margaret Beaufort, Derby became step-father to King Henry VII. Derby was a key figure in the Battle of Bosworth and crowned Henry upon the battlefield. Upon the death of Isabel, Lady Tunstall, Tunstall re-married to Hon. Joan Mowbray, daughter of Sir John de Mowbray, 4th Baron and Hon. Elizabeth Segrave, herself the daughter of Lady Margaret Plantagenet, daughter of Thomas of Brotherton. The marriage produced no children, but the Tunstall’s had step-siblings from Joan’s first marriage to Sir Thomas Grey which included John Grey, Earl of Tankerville. Blanche de Brienne and William Fieness, Baron of Tingry; Blanche was the granddaughter of Emperor Jean of Brienne, King of Jerusalem and Infanta Berenguela of León, Empress of Constantinople. By this lineage the Parr’s descended from Eleanor of England, Queen of Castile, daughter of Henry II of England and his consort Eleanor of Aquitaine. By this lineage the Parr’s also descended from the Jimenez Kings of Navarre; the infamous Garcia Ramirez, King of Navarre who “restored” the independence of the Navarrese crown after 58 years of union with the Kingdom of Aragon. The Jimenez dynasty had been ruling Pamplona, later Navarre, since 905 AD. Garcia Ramirez was the grandson of the illegitimate son of Garcia Sanchez III of Navarre. After the assassination of the King’s son, Sancho IV, Navarre was taken over by the Aragonese. Geoffrey Plantagenet, founder of the Plantagenet Kings of England through several lines. Stephen Blois, Count of Aumule. The Brus family from which came Robert de Brus, King of the Scots. Katherine descended from every King of England who had issue up to King Edward III. Katherine Parr was also the only queen of King Henry VIII to descend from the Beaufort’s; the illegitimate, later legitimized issue of Prince John of Gaunt, 1st Duke of Lancaster and his third wife, Katherine Swynford Roet. King Henry’s first wife, Katherine of Aragon, also descended from John of Gaunt by his first two wives. Sir William Parr’s wife, the Hon. Elizabeth FitzHugh, was the daughter of Henry, 5th Baron FitzHugh of Ravensworth Castle and Lady Alice Neville. FitzHugh, himself, descended from Henry I (several times), Henry II, and John I (twice); all from illegitimate children. 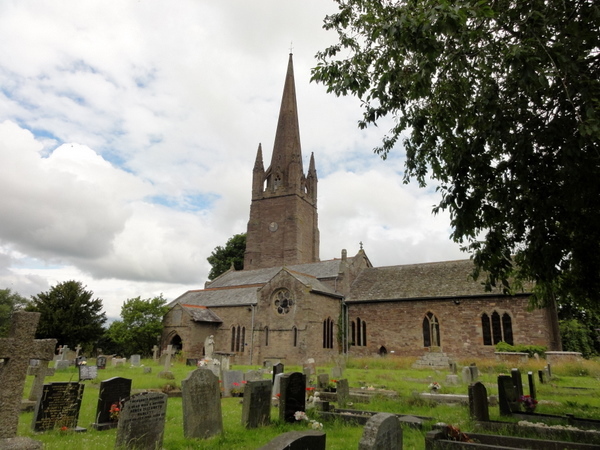 His family was an old baronial family of England descending from Akarius Fitz Bardolph, Lord of Ravensworth (d.1161), the son of Bardolph an 11th century nobleman living in Richmondshire, the area encompassing the Ure, Tees and Swale valleys in northern England. The 5th Baron was the son of William, 4th Baron FitzHugh and Margery Willoughby; by his mother he was a nephew of Richard Willoughby, 6th Baron Willoughby of Eresby. Lady Alice was sister to Richard Neville, 16th Earl of Warwick and 6th Earl of Salisbury [best known as “Warwick, the Kingmaker”] and other prominent noblemen and women. Her cousin, Sir George Neville, 1st Duke of Bedford was intended to marry Elizabeth of York [mother of King Henry VIII]; this obviously fell through due to his father and nephew’s [Warwick] rebellion against Edward IV. 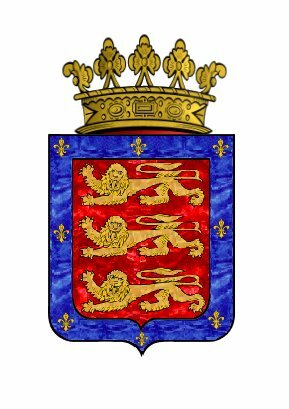 The Neville’s were already established at court being grandchildren of John of Gaunt’s legitimized daughter Lady Joan Beaufort, Countess of Westmorland. 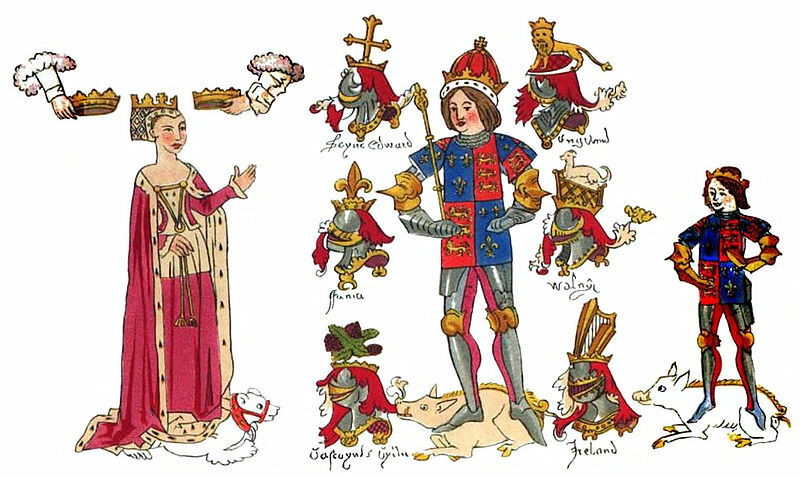 Katherine was just about related to every noble and royal at court who came before or during her time; Edward IV and Richard III were first cousins (thrice removed of Katherine Parr). Their wives, Queen Anne Neville and Queen Elizabeth Woodville, were also a first cousins. [The Woodville connection comes from Katherine’s mother, Maud Green — Queen Elizabeth was a first cousin, thrice removed of Katherine]. This connection made her related to all of her husbands in one way or another. William the Conqueror by his illegitimate son William Peverell and legitimate daughter, Adela of Normandy. Lord Salisbury’s siblings included Lady Anne who married thrice. By her marriage to Sir Richard Hankford they were ancestors to Anne Boleyn. After being widowed, she became Duchess of Exeter as wife to the 2nd Duke of Exeter (nephew of the 2nd Earl of Kent, ancestor to Queen Katherine Parr). William, the Conqueror twice by his daughter Adela of Normandy and his illegitimate son William Peverell. Lord Thomas Holland, 1st Duke of Surrey, 3rd Earl of Kent. Lady Elizabeth who married Sir John Neville; ancestors to the Earls of Westmorland (Neville was the heir to the 1st Earl and his first wife Lady Margaret Stafford. The Earl would later marry Lady Joan Beaufort — the two were ancestors to Queen Katherine Parr). Lady Joan married to Edmund of Langley, Duke of York — no issue. Nevertheless she was styled Duchess of York. Lady Alianore, Countess of March, wife to the 4th Earl of March — and through them the crown of Edward IV was claimed by their daughter, Lady Anne Mortimer, Countess of Cambridge (wife of Richard of York, 3rd Earl of Cambrige, brother to Lady Constance of York). The Countess would marry again to the 5th Baron of Powis, their grandson would marry the illegitimate daughter of the Duke of Gloucester (son of King Henry IV), Lady Antigone. Lady Margaret, Countess of Somerset and Duchess of Clarence married John Beaufort, 1st Earl of Somerset (illegitimate son of John of Gaunt by Katherine Swynford) and by him they were ancestors to Lady Margaret Beaufort, mother of Henry VII. Margaret would re-marry to Thomas of Lancaster, Duke of Clarence, grandson of John of Gaunt by his son King Henry IV. Lady Salisbury’s [Lady Eleanor Holland] paternal grandmother was Princess Joan of Kent, suo jure 4th Countess of Kent and later Princess of Wales. Her story is one of interest. She married firstly to Sir Thomas Holland who became 1st Earl of Kent through her inheritance. By him she had Lady Salisbury’s father, Sir Thomas Holland, 2nd Earl of Kent. Her uncle was Sir John, 1st Duke of Exeter who married Lady Elizabeth of Lancaster, daughter of Prince John of Gaunt and his first wife, Blanche of Lancaster. They were parents to John Holland, 2nd Duke of Lancaster who married thrice; Lady Anne Stafford, Beatrice of Portugal, and Lady Anne Montacute. His second wife, Beatrice of Portugal was half-sister to Edward I of Portugal; John, Lord of Reguengos de Monsaraz; and Afonso, Duke of Braganza. Lord of Reguengos was a grandfather to Queen Isabella of Castile (mother of Queen Katherine of Aragon) while the Duke of Braganza was a great-grandfather. Lady Salisbury’s paternal aunts were Lady Joan, Duchess of Brittany [wife to John V of Brittany] and Lady Maud, Countess of Ligny [wife to Waleran III of Luxembourg; their daughter Jeanne married Antoine de Valois, Duke of Brabant]. Joan of Kent’s third marriage was to Edward, Prince of Wales [eldest son and heir of King Edward III]; their son was King Richard II of England and thus granduncle to Lady Salisbury. John Holland, 1st Duke of Lancaster. Lady Joan of Arundel, mother to the uncrowned Mary de Bohun, wife of Henry IV and mother to Henry V. Her other daughter became Duchess of Gloucester as wife to Lord Thomas of Woodstock, Duke of Gloucester, youngest son of King Edward III. Sir Richard, 11th Earl of Arundel who’s daughter Margaret became Duchess of Norfolk; another daughter Joan became Lady Bergavenny, ancestress to Lords Bergavenny, Earls of Shrewsbury, and grandparents to the 7th Earl of Ormonde (ancestor of Queen Anne Boleyn). Sir John, 1st Lord Arundel — ancestor to the later Earls of Arundel and Dukes of Norfolk. Lord Arundel’s great-grandson married Lady Joan Neville, sister of “Warwick, the Kingmaker” and Alice (great-grandmother to Queen Katherine Parr). 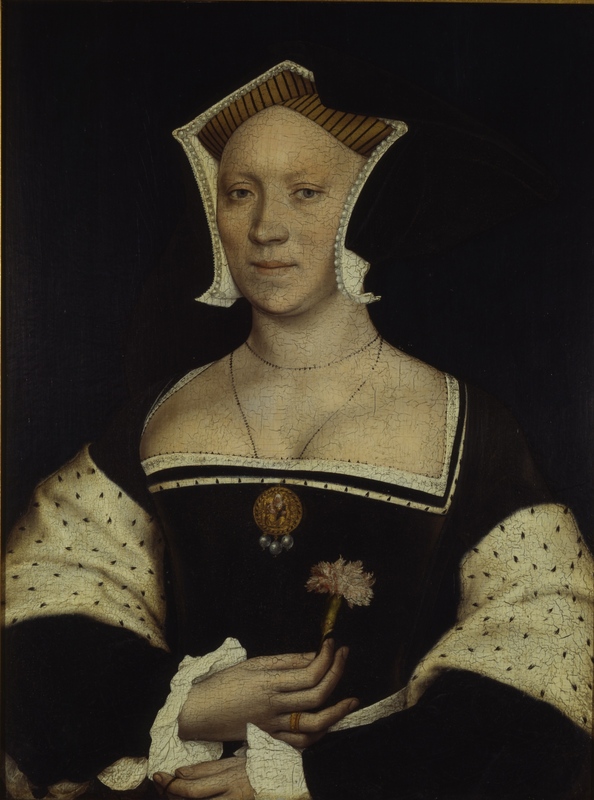 Katherine’s father, Sir Thomas Parr, was a close friend of King Henry VIII; Parr’s step-father, Sir Nicholas Vaux, had been educated in the household of Lady Margaret Beaufort, Henry’s grandmother, where Parr is also believed to have spent some time. Sir Thomas was present at court and was in the circle of Henry VIII which included Sir Thomas Boleyn. Both were knighted in 1509 at Henry’s coronation; Parr was also made a Knight of the Garter and appointed Sheriff of Northamptonshire on that occasion. Parr became Master of the Wards and Comptroller of the household of Henry VIII. Parr’s brother, William [later Baron Parr of Horton], was also a part of the King’s circle. They kept company with the Stafford’s and their cousins, the Neville’s. They were also friend’s with the Carew’s and Sir Thomas Boleyn, father Queen Anne Boleyn. In 1515, Parr was entrusted with escorting Queen Margaret of Scotland [the king’s elder sister] from Newcastle back to London. The “lowly” marriage of Mary Boleyn to Sir William Stafford — unlike “The Tudors” insistence that he was a “nothing” — Stafford was actually the grandson of Sir John Fogge and Alice Haute (cousin to Queen Elizabeth Woodville). This connection made Stafford a cousin to Parr’s mother, Maud Green (her aunt was Stafford’s mother, Margaret). Katherine’s brother, William, entered the household of Henry Fitzroy, the King’s illegitimate son, at the age of eleven. It was there that he met Henry Howard, Earl of Surrey. They were educated together and Katherine’s uncle, Sir William, Baron Parr of Horton, was part of the head of the household for Fitzroy. From Sir Thomas’ grandmother to his own daughter, Anne, were all ladies-in-waiting to the queens of England. His grandmother and mother both personally served under special appointment by Richard III’s consort herself, Lady Anne Neville. 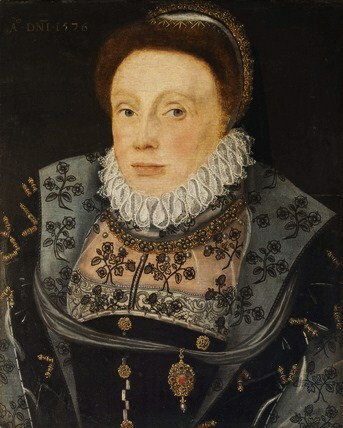 Anne was the niece of Parr’s grandmother, Lady Alice Neville. 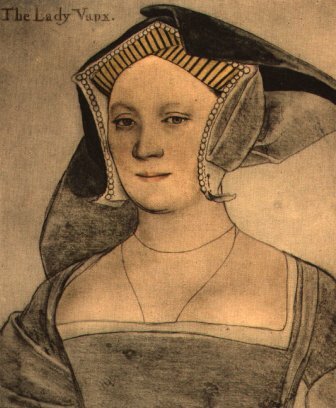 Katherine’s sister, Anne Parr [Herbert], was one of the few women to serve all six of Henry’s wives. Maud Parr nee Green, his wife, was good friend’s with Queen Katherine of Aragon and a lady-in-waiting to her. She was given private chambers next to the queen’s and Queen Katherine was supposedly Katherine Parr’s godmother. Lady Parr’s grandmother, Lady Alice Fogge (Haute) was a lady to Queen Elizabeth Woodville (see below). If Sir Thomas had not died at such an early age he would have been given the title which his brother received or another barony. He was also co-heir to the FitzHugh barony; which is still in abayence between the descendants of his aunt Alice FitzHugh, Lady Fiennes and his daughter, Anne Parr, Countess of Pembroke. Katherine’s mother also descended from royal blood. Maud Green’s family had long served the crown. Sir Henry Green (died 6 August 1369) was an English lawyer, and Chief Justice of the King’s Bench from 24 May 1361 to 29 October 1365. Early in his career he served both Queen Isabella (consort of Edward II) and Edward the Black Prince. He was made justice of the Court of Common Pleas in 1354, and knighted by King Edward III. By her grandfather, Sir Thomas Greene of Greens Norton, Queen Katherine directly descended from King Fergus of Galloway and many nobles and Kings of England which included William the Conqueror, John of England, Henry I by three illegitimate children and Empress Matilda, Edward I, and Henry II of England by two legitimate children and one illegitimate. By both husbands of Isabella of Angoulême, Queen Consort of England; from Welsh nobility like Nest Ferch, Princess of Wales, Llewelyn Ap ‘The Great’, Gwladys Dhu verch; Spanish royals such as Alfonso II of Aragon, Alfonso IX of Aragon; they also descended from French royalty Charles I, Henry I, Louis VII of France and Scottish royals such as David I, Maud of Huntingdon; and from Jean of Brienne, King of Jerusalem through her connections with the Ferrers of Groby, Talbot, Despencer, FitzAlan, De Clare, Earls of Ormonde, and other noble families. By her mother, Joan Fogge, Lady Parr was a cousin to Elizabeth Woodville, queen consort of Edward IV; descending from Queen Elizabeth’s grandfather, Sir Richard Woodville. When Elizabeth became queen to Edward IV, she brought her favorite female relatives to court to serve her. Lady Parr’s grandmother, Lady Alice Fogge (born Haute), was one of five ladies-in-waiting to her cousin Elizabeth Woodville in the 1460s. Queen Katherine and Henry VIII’s closest relations: Third cousins (through Sir Richard Wydeville and Joan Bedlisgate); third cousins once removed (through Ralph Neville, 1st Earl of Westmorland and Lady Joan Beaufort); and double fourth cousins once removed (through Thomas Holland, 2nd Earl of Kent and Lady Alice FitzAlan and John of Gaunt, 1st Duke of Lancaster and Katherine Swynford). Queen Katherine also shared ancestors with her 4th husband, Thomas Seymour, but the closest one is Edward III and Philippa. Douglas Richardson. “Plantagenet Ancestry,” 2005. Douglas Richardson. “Magna Carta Ancestry,” 2nd Edition, 2011. David Starkey. “Six Wives: The Queens of Henry VIII,” HarperCollins, May 4, 2004. pg 690. Google eBook. John Burke. “A general and heraldic dictionary of the peerages of England, Ireland, and Scotland, extinct, dormant, and in abeyance,” 1831. Thoroughly researched. One line still in question: Sir Roger, 4th Baron Strange of Knockyn’s wife, Maud, who has been theorized as the illegitimate daughter of Enguerrand VII de Coucy, 1st Earl of Bedford which would relate her back to ancestors like the Habsburgs; the Chatillions; the Wittlesbachs; Beatrice of England, Duchess of Brittany [daughter of Henry III of England and Eleanor of Provence]; Matilda of England, Duchess of Saxony [daughter of Henry II of England and Eleanor of Aquitaine]; the Champagne and Jiminez Kings of Navarre; and more. Sir John Fogge is know for being the great-grandfather of Queen Katherine Parr and other prominent Tudor courtiers. Sir John Fogge (c.1417-1490) was Lord of the manor of Repton. His family was one of the first families in Kent, England. It was this John Fogge of Ashford who built and endowed the noble Church and the College at Ashford, Kent circa 1450, where he is also buried. There is some uncertainty over the parents of Fogge. The most well-known source, “The Family Chronicle of Richard Fogge” shows John as the son of Sir William Fogge and an un-named daughter of William Wadham (his second wife). “The Antiquary” states that he was the son of Sir William and his first wife, a daughter of Sir William Septvans. However, Rosemary Horrox argues that he was the son of another John [and Jane Cotton]; Sir William’s younger brother. Horrox also states he must have been born about 1417, since he was of legal age in 1438, and came to prominence when he inherited the senior line of the family by February 1447. 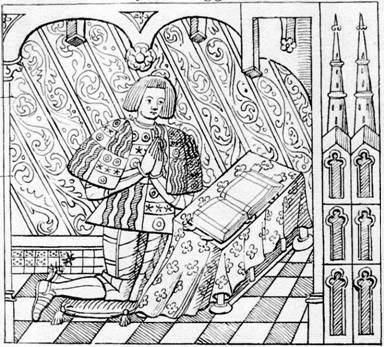 John Fogge was for certain the grandson of Sir Thomas Fogge, who died in 1407. Fogge was buried in Canterbury Cathedral. He had been a soldier and courtier under King Richard II and his successor, the Lancastrian usurper, King Henry IV. Fogge’s standing in Kent was owed much to his early career as a Captain of war in France. His military service began in the retinue of Henry, Duke of Lancaster, the King’s lieutenant in Brittany from 1356. Like the Parrs’, he served John, Duke of Lancaster; the third surviving son of Edward III. He was of service to Lancaster in Spain in 1386. It is uncertain for how long Fogge had been a retainer of Lancaster, but on 13 June 1372, the Duke formally retained him for life. Lancaster made mention of Fogge’s good service in the past and indicated by the size of the annuity granted (100 marks) that he ranked him high in his esteem. Under Lancaster, Fogge was Captain of Calais among other high postings. Thomas Fogge’s eldest son, John, came to the court of the Lancastrian King Henry IV. John served on a number of commissions and was appointed Sheriff of Kent in 1453. John would continue to hold favor under the new King and gained the esteemed office of Comptroller of the Household in 1460 and keeper of the wardrobe to Henry VI in the last year of his first reign. John was knighted by the King in 1461. In 1461 and 1463, under the Yorkist King, Edward IV, John Fogge was elected to Parliament as knight of the shire for Kent. Fogge became a Privy Councillor. From 1461-68, he was Comptroller and Treasurer of the Household [later known as Lord Chamberlain under the Tudor monarchs]. Fogge would continue that role for the Prince of Wales (later King Edward V). In 1461, Fogge was granted the office of keeper of the writs of the Court of Common Pleas. He took part in the investigation of the possible treason of Sir Thomas Cooke. In 1467, he was MP for Canterbury and Sheriff of Kent, again, in 1472 and 1479. He represented Kent in parliament in 1478 and 1483. It is thought that Fogge may have accompanied Edward into exile. For Fogge’s continued loyalty to the Crown, he was awarded the Constableship of Rochester Castle, the keeping of Hothfield Manor, and the manors of Towton and Dane, which had formerly belonged to the Lancastrian loyalist, Sir Thomas Brown. From 1473, he was on the council and one of the tutors of Prince Edward (the future King Edward V). He undertook administration of his property and was made Chamberlain jointly with Sir John Scott. Fogge’s kinsman, Anthony, Earl of Rivers, was appointed the Prince’s Governor. Fogge’s Haute kinsmen also rose in royal favor; Richard Haute had also become one of Prince Edward’s tutors and councilors and by 1483 Haute was controller of this household. In 1483, he supported Richard Guildford in Kent against Richard III, this rising being in support of Edward V, and becoming part of the unsuccessful Buckingham’s rebellion. This was despite an apparent reconciliation with the king as soon as he came to the throne, after Fogge had taken sanctuary in June 1483 at the time of Richard’s coup in Westminster Abbey. The rising was blocked at Gravesend by John Howard, 1st Duke of Norfolk; and the rebel force retreated. The king acted mercifully once order had been restored; but Fogge later did have lands in Kent confiscated and given to Sir Ralph Ashton.Throughout the many conflicts which arose with the War of the Roses, Sir John was lucky enough to survive, especially when Richard III came to the throne. Sir John was a supporter of Henry Tudor and reportedly had a role in the Battle of Bosworth field. Because of this, Sir John’s lands that were attained during King Richard’s reign were restored as soon as King Henry VII came to power. There is some confusion as to which wife he married first; they were both named Alice. It is thought that Alice Haute was Fogge’s first wife. His second wife was Alice de Criol or Kyriell, the daughter of the Yorkist Sir Thomas de Kyriell who was killed at the second battle of St. Albans. This marriage brought him Westenhanger Castle.The “History of Ashford” states that Alice de Kyriell was Fogge’s first wife and that Alice Haute was his subsequent marriage. However, it then states that Alice was formerly married to a Woodville; which is not true. She was the daughter of a Woodville. 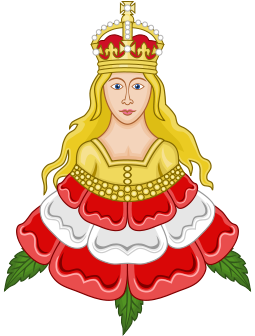 Fogge’s switch from the Red Rose of Lancaster to the White Rose of York was most likely due to his marriage into either the Woodville or Kyriel family; both families joined the Duke of York [later King Edward IV] in 1460. Fogge, Sir William Haute [father of Alice], and Sir Thomas Kyriel [father of Alice] were part of the first group to join the Yorkist earls when they arrived at Kent in 1460. 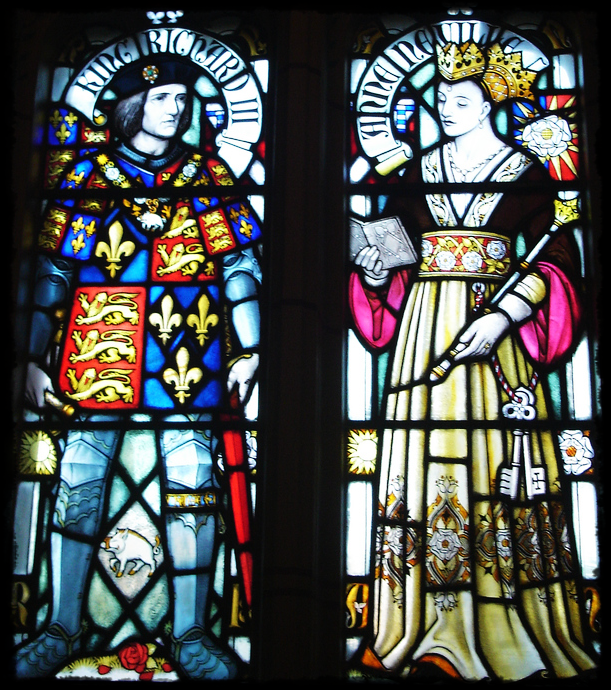 Edward IV and Elizabeth Woodville by Sophie Carter. Fogge’s first wife was Alice Haute or Hawte (born circa 1444), whom he had married c. 1465. She was the daughter of Sir William Haute of Hautsbourne, Kent (c.1390-1462) and Joan Woodville, sister of Richard Woodville, 1st Earl Rivers; and as so Alice was first cousin to Elizabeth Woodville, queen consort to Edward IV, and mother to Elizabeth of York. When Elizabeth became queen, she brought her favorite female relatives to court. As Lady Alice Fogge, Alice was one of the queen’s five ladies-in-waiting during the 1460s. Fogge and Alice (Haute) were great-grandparents to the last queen consort of King Henry VIII, Katherine Parr, through their daughter Joan, Lady Greene. Their other children included Sir John Fogge of Repton Manor and Margaret, Lady Stafford (mother of Sir William Stafford, husband to Mary Boleyn). There is a very slight possibility that Richard III’s mistress (or one of them) and mother to his illegitimate daughter was the sister-in-law to Lady Fogge. Katherine was the wife of James Haute (son of William Haute and Joan Woodville). Little is known about her; however in 1477 Richard in a grant gave to Katherine Haute 100 shillings per annum for life (DL29/637/10360A). There is no apparent reason for Richard to give her an annuity, and her Christian name is of course that of Richard’s illegitimate daughter, an uncommon one in the Yorkist Neville families. All of this may of course be far from the truth, although it is suggestive. Fogge died in 1490. The tomb in which he’s buried stands on the North side of the altar between the chancel and Fogge Chapel. The original ornaments have been stripped, but there were originally brass effigies of his two wives, Alice Kyriell and Alice Haute. The mantels of the wives were fastened with a rose. At their feet were crouched dogs with knotted leading strings. On the south side of the tomb had been enriched with Gothic arches where three shields were found; Kryiell, Haute, and Valoignes impaling Fogge. Fogge’s effify was attired in rich armor and decorated with the Yorkist collar of suns and roses with the white lion of Marche. His head reclined on his helmet, adorned with mantlings and crest. At his feat sat an Italian greyhound. On the north side the center ornament was an angel supporting an inscription panel with an endless circle formed of rose sapling sticks firmly bound together perhaps to show the stability of the family unity, the vitality of which is indicated four small sprouts of rose branches with leaves and blossoms. Four large bosses of the united Roses proclaimed a Yorkist’s acquiescence in the peaceable conclusion of the commotion. 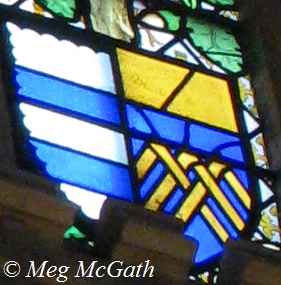 Their arms, Argent, on a fess, between three annulets, sable, three mullets, pierced of the first, which coat is carved in stone on the porch of Ashford church, on the roof of the cloysters at Canterbury, and in several windows of the cathedral there. Drawings by Sir Edward Dering, 17th Century, published in Archaelogica Cantiana, Vol 2, 1859 [out of copyright]. Charles Ross, Richard III (1981), p.106. J. R. Lander, Conflict and Stability in Fifteenth-century England (1971), p. 180. Arelene Okerlund, Elizabeth, England’s Slandered Queen (2006), p. 104. Paul Murray Kendall, Richard III (1972), p. 261. Michael Bennett, The Battle of Bosworth (1987), p. 41 and p. 43. The Lineage and Ancestry of H.R.H. Prince Charles, Prince of Wales, by Gerald Paget, Vol. I, p. 95. ‘Parishes: Stanford’, The History and Topographical Survey of the County of Kent: Volume 8 (1799), pp. 63-78. URL: http://www.british-history.ac.uk/report.aspx?compid=63459&strquery=fogge Date accessed: 05 December 2012. E.W. Allen. “The Antiquary,” Vol. 3-4, 1873. Sheila Sweetinburgh. “Later Medieval Kent, 1220-1540,” Boydell & Brewer, Nov 18, 2010. pg 258. Douglas Richardson. “Plantagenet Ancestry: A Study In Colonial And Medieval Families,” 2nd Edition, 2011. pg 219-25. The History of Parliament: the House of Commons 1386-1421, ed. J.S. Roskell, L. Clark, C. Rawcliffe., 1993. Edward Hasted. ‘The town and parish of Ashford’, The History and Topographical Survey of the County of Kent: Volume 7 (1798), pp. 526-545. Rev. A. J. Pearman. “History of Ashford,” H. Igglesden, 1868. Peter Hammond. “His Illegitimate Children,” Dr Rosemary Horrox notes. Richard III Society: Richard III — His Family.